Make Money From Home Doing Something That's Fun and Easy! Have you been searching for something that you can do from home to make some extra money or maybe even a full-time living, but haven't found the right opportunity yet? Many People just like you are looking for a way to earn some extra money or want to work from home full-time but just can't seem to find the right opportunity. Many opportunities may be too time consuming, too expensive or maybe they just don't fit your skills or interest? Maybe you've already tried some of them, but they didn't work out well for you. Well now your search is over! Did you know that one of hottest growing home business opportunity is in the gift basket industry? This booming home business is now topping more than $3 billion in sales a year, and is expected to continue to climb as more and more business-minded people become aware of this fun and popular business! The giving of Gift baskets continues to grow in popularity as people have found it to be a great way to give many gifts in one container that is decorated and usually based on a theme or a special occasion. Gift baskets have really caught on in the Corporate world as well, as many businesses find it to be the perfect gift to thank their customers for their business. You may be thinking that creating gift baskets would be difficult and expensive but it's really not! You don't need thousands of dollars to get your Gift Baskets Home Business started. You can get started with just a small budget! The time it will take for you to put together a beautiful gift basket is very minimal. You'll spend more time shopping for the gift basket items then you will in the actual creation process. Many people find they can assemble the gift basket in less than 15 minutes and have it ready to give to that special recipient! and the list could just go on and on, but you get the idea. A "Gift basket Home Business" is an excellent way to generate some extra income for anyone with some time to spare, retired people, or stay-at-home Moms as well. Since you would be working from your home and the cost of the supplies are minimal, it won't cost you much to get started, yet you can charge a good price for custom designed gift baskets! You could get started with less than $90 and have a few great baskets to sell, then expand as business grows! Just imagine how great it would feel to have that extra money coming in or working full-time from home...working your own schedule instead of someone else's! No more commuting to work, working at a job you hate, or paying a babysitter! A Gift Baskets Home Business is something that can produce a steady income for you year round without slowing down! Every day is a good day for a gift basket! Creating Gift baskets gives you a chance to unleash your creative side while providing a beautiful package! 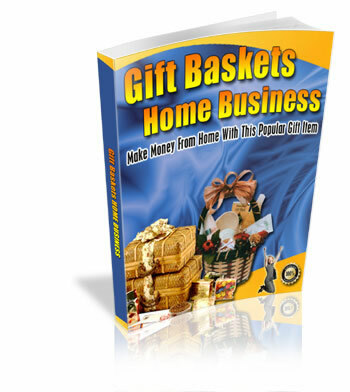 The "Gift Baskets Home Business" guide will provide you with the information you need to begin creating and giving some wonderful hand-made gift basket creations that everyone will love! Here's some of what's covered in this informative ebook. If you’ve been searching for the right work-at-home-business that's right for you then you've come to the right place! The "Gift Baskets Home Business" ebook can help you turn those dreams into reality … saving you money and frustration! If you're serious about earning money from home, with something that's not expensive or difficult to get started with, you'll want to get this report right now and read it today. You're probably thinking this is going to be expensive, but......Do you want to know what it will cost you to get this incredible Gift Baskets Home Business information; information that can help you start making money from home? Yes, that's right...for the price of inexpensive restaurant dinner you will have the information you need to get started earning that extra cash you've been longing for! Why am I charging just $9? I know I could sell this report for $20 or even $30, so why am I only charging $9 for it? People looking to make money from home need this information, and $9 puts this report within reach of the vast majority of people. At this price, it's still affordable even for people who don't have much money. Many people are looking for a work-at-home opportunity that's easy and inexpensive to do , and have no idea where to find one! If you want to learn more about earning money from home, badly enough to put down the price of a inexpensive restaurant dinner, to buy this report, you will have the opportunity to learn how to get started with your own "Gift Baskets Home Business". So if you're tired of being broke and ready to take action today, click the "Order" button below. If you need to justify the expense, skip going to eat for dinner just once this week and, it's paid for. Sounds like an excellent trade off to me!